Lots of fresh, fun, modern home furnishings are on display this week, January 18th – 23rd 2011 at the annual imm cologne design fair in Germany, including entries in the [D3] design talent contest. Dezeen is there holding talks with designers and up-and-coming design figures, and have featured a few of the most eye-catching creations including a cocoon-like couch, a folding table and ultra-lightweight chairs made from a single sheet of metal. 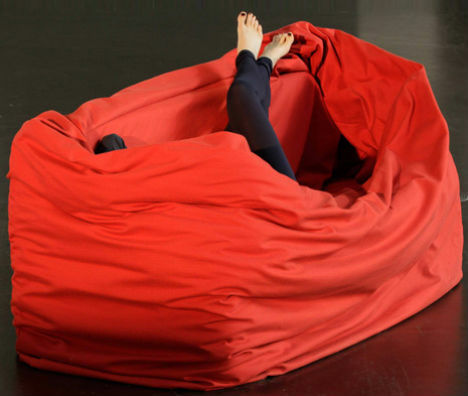 Coming in second place in the [D3] design contest is Hanna Emelie Ernsting’s ‘Moody Couch’, an interactive couch cover based on the designer’s idea that “form follows moods”. The cover is much larger than the couch underneath it, and is made of a special textile that retains the shape it’s scrunched into. 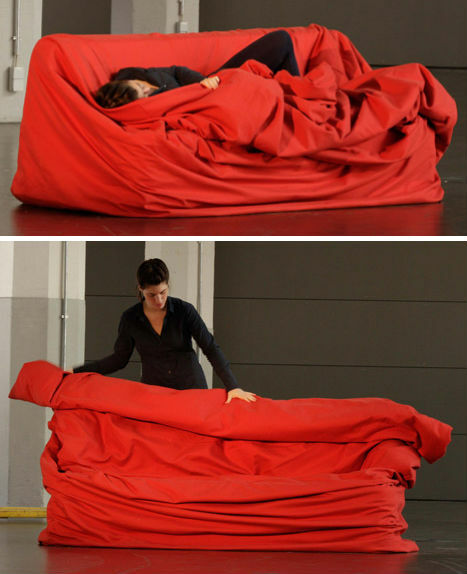 Users can pull it up into cozy little forts, mold it into body-pillow-like bunches, pull it down onto the floor or use it to sculpt the couch into a new shape. 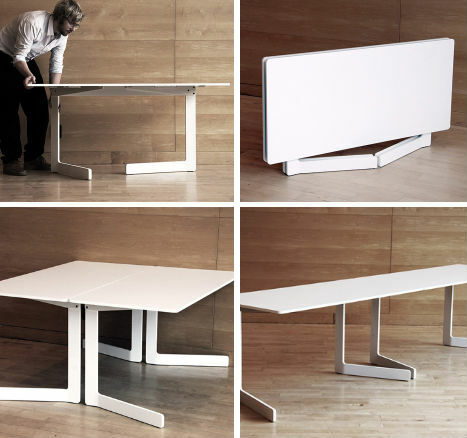 One of two joint winners for first prize is the OLA table by Swedish designers AKKA, a lightweight folding table that easily folds and unfolds but always stays on its feet, preventing the soil and scuffing that plagues other portable furniture. “Even a fairly small lady could unfold a hundred tables at a conference without risking her health, since you dont have to turn the whole table around,” say the designers. The second joint first-place winner is the Pressed Chair by Harry Thaler. Sleek and simple, the chair is incredibly light weight thanks to its all-aluminum construction, but still able to handle heavy loads due to a relief pressed into the surface, which increases its structural strength. 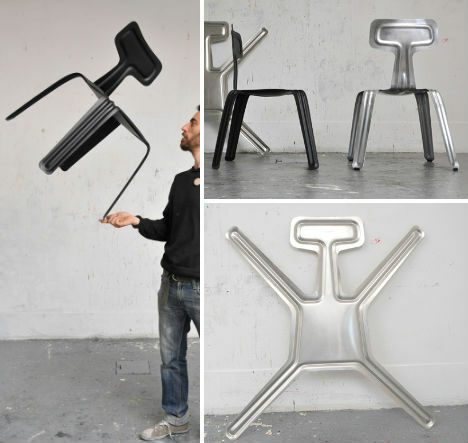 The chair is made from a single sheet of 2.5mm aluminum, and even the scraps from the cutout get used, bolted together to form a stool.